Teen Camp…Come make a difference! 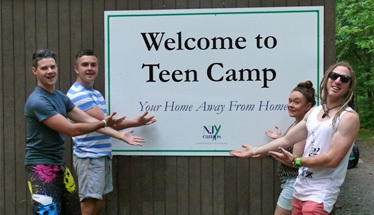 Located in the Pocono’s of Milford, Pennsylvania on 1250 wooded acres, NJY Teen Camp, or TAC is a place that caters for high school students. We believe that teenagers at high school level are looking for summer experiences that will challenge them, provide them with a sense of ownership and an opportunity to make incredible connections. Each experience at Teen Camp is designed to help develop leadership, growth and great memories. 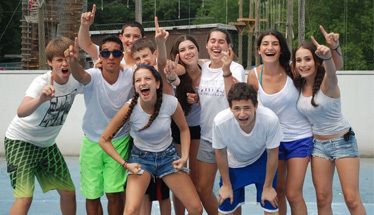 Campers live in cabins with other teenagers in their grade and form instant connections that become very special for the future and beyond. They experience a wide array of activity choices as well as travel experiences, service learning opportunities and leadership training components. Please review the FAQ’s for more specifics on what our camp offers. Our Teen Campers can add on Total Specialty Camps where they can focus on sports, sciences, art, ceramics, dance or chess. Teen camp is a place for campers to thrive while receiving a clear structure and set of boundaries but enough freedom and flexibility to explore new interests and have the opportunity to step up and take on positions of responsibility. We challenge our TAC campers to think about new ideas, put themselves outside of their comfort zone and gain an appreciation for helping and benefiting others. Campers leave completely inspired by the opportunities they’ve explored and the new ideas they’ve been exposed to. Teen Camp is designed to provide a diverse range of opportunities so that campers can enjoy participating in traditional camp activities, supplemented with new experiences that they will not have yet experienced. Elective options feature over 75 different choice activities including sports, arts, sciences, waterfront, adventure and the additional TACtivities providing new and exciting programming to TAC. All campers get to participate in a travel experience during each session of camp, providing them with the chance to explore a new place and participate in volunteer work, site seeing and adventure. Our service learning program provides campers with meaningful volunteer work and a connection to local not-for-profits agencies. All hours completed can be used towards high school volunteer requirements. Our leadership training program provides a curriculum of fundamental skills teaching as well as certifications in lifeguarding, ropes and sports coaching. Campers then have the opportunity to apply their learned skills through internships and special camper led project committees. We believe in making Teen Camp a place that can offer something for everyone while challenging anyone.